1. Rub pork with ginger, garlic and paprika. 2. Place pork in slow cooker or ovenproof dish. 3. Arrange celery, onion, carrots and bay leaves around pork in dish. 4. 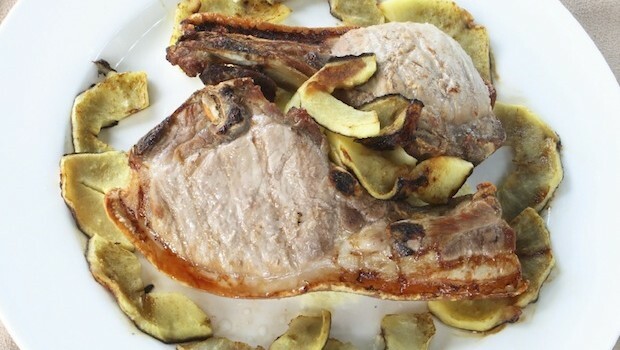 In a bowl, whisk together wine, apple juice and vinegar and pour over pork. 5. Cover and leave to marinade in the refrigerator overnight. 6. Right before cooking, prepare apples and add to dish. 7. If using a slow cooker, cook 6 hours on high. If using a conventional oven, cover and bake at 300 degrees for 3-and-a-half hours. 8. Serve right away and enjoy leftovers in sandwiches and salads.